The Drumlane area has been inhabited since prehistory, maybe for over four thousand years.. Some of the first inhabitants lived on lake dwellings or crannogs, and one can still be seen in the lake below the Abbey. In the sixth century a monastery was founded by St Mogue (mAedh óg), a native of Templeport who may have studied with St David in Wales. He also founded the church of Ferns in Co. Wexford, where he is called St. Aidan. The first monastic buildings were of wood but they were replaced in the 12th century, when the abbey adopted the Augustinian monastic rule. The base of the round tower and the remains of the monastic buildings to the south of the church date from that time. The single nave church was built in the middle of the 15th century, as was the upper part of the round tower. The church was adorned with sculptures, some of which have survived, including two stone heads over the door of the church. Throughout the middle ages the abbey and its lands were ruled by the O Farrelly clan. They claimed to be descendants of St Mogue, and they held the title of coarbs (from the Irish comharba, a successor). a medieval grave slab with intricate carving, to the north of the church, is said to mark the burial place of one of these Coarbs. The church is the largest of the buildings to survive, but the monastery was far more extensive. The foundations of the buildings used by the monks can be seen in between the nave of the church and the lake. 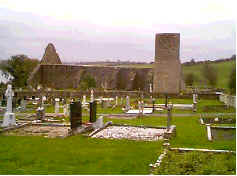 Drumlane was attacked on at least one occasion, in 1261 by the O'Rourkes. A possible reason was that the O'Rourkes and their allies, the O'Connors had attempted to wipe out the power of the O'Reilly family. At a battle near Ballymagovern in 1256 they had more or less succeeded, killing the head of the family, two of his sons, and his brother. The remnants of the O'Reilly family had attempted to regroup after this catastrophe, possibly in the Drumlane area. In the 16th century the monastery was suppressed as part of the Reformation, though the church remained in use for Divine service for another two and a half centuries. Some of the lands were granted by the English crown to the OReilly clan, but after the defeat of the rebellion of 1641 all of the lands in the parish were held by planters. During the Great Famine of 1845-48 a fever hospital was established in the parish, although according to tradition the area was not as badly hit by starvation and disease as other parts of Cavan. Clough Oughter castle is situated three miles from Killeshandra and about ten miles from Cavan. The castle dates from the early thirteenth century when a simple stone fortification was built by the Anglo-Normans during their brief occupation of east Breifne, but was soon captured by the O'Reilly clan. For much of the later middle ages the castle was only used as a prison for dissident members of the O'Reilly family. Historically the castle is most famous for its part in the fluctuating and bloody struggles of 1641-53, between the native Irish rebels and the Ulster settlers, supported by General Munros army sent by the Scottish parliament. After the oubreak of the rebellion of 1641 the castle was used as a prison. Amongst those incarcerated was William Bedell, the Protestant bishop of KIlmore and the man who had instigated the first translation of the Bible into Irish. The castle is also famous for its associations with Owen Roe ONeill, the military supremo of the rebels, who died near Clough Oughter in November 1649. 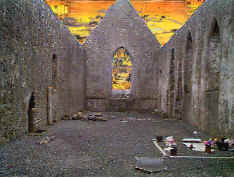 He was buried in the Franciscan friary at Cavan town. Clough Oughter was one of the last places to hold out against the forces of Oliver Cromwell, the English Lord Protector. It surrendered in the Spring of 1653, after a canon-ball had blown a large breach in one of its walls. The site was excavated in the late 1980s, and much work has been done to preserve its ruins. The church was designed by Cavan architect William Hague Jr (1836-99) who was responsible for many other churches throughout Co. Cavan, including Butlersbridge and Killeshandra.. It was built on the site of an earlier church in the 1860s and was opened for worship in March 1868. 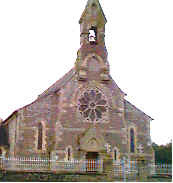 Fr Patrick O'Reilly, Parish Priest of Drumlane, had originally wanted to build the new church at Monea Cross, but his request to the local landlord, David Fielding Jones, was not successful. Jones replied: 'I cannot comply with the request ... Were I to do so I should be acting against my conscience and most inconstingly.' Lord Annesley, another local landlord, was less troubled by matters of conscience and granted Fr O'Reilly land adjacent to the old church. On the occasion of its dedication admission to some of the best seats was restricted to the better-off members of the congregation, who could occupy a family seat in exchange for £1 - a huge sum equivalent to many men's weekly wage. A local tradition says that the bell had originally been intended for the parish church in Killashandra, but it was found to be too heavy - so Milltown got it instead!